Researchers in the US have created an artificial jellyfish from silicon and living cardiac muscle cells, and it can swim freely. 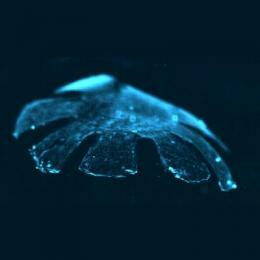 The rat heart muscle tissue is stimulated electrically and this ‘beats’ to create the jellyfish’s propulsive force. This is called ‘Medusoid’ and could be a step towards synthetic life. For more, read the paper in Nature Biotechnology.